Kids naturally love to “help” in the kitchen and I have found that by providing them with the proper tools that they can actually be helpful! These tools are fun for adults, too. They can often make simple meals into something more “fancy” without a lot of extra effort. My kids (and all my Waldorf kids too) have been using these tools since they were three and at this point my son is quite the kitchen helper! My son also seems to love all things mechanical (electronic or not) so he loves to make coffee or tea for us in the coffee press and loves to grind the beans with the grinder first. He also really enjoys the juicer. We have a centrifugal force juicer that is very easy for him to use and he is fascinated with the mechanics of it. Before he used it the first time he had to inspect each part and figure out how it works and now he begs me to “let” him make me juice! Sofi enjoys helping too, but usually if I am working with her. Sofi is 9. I am sharing a picture of our favorite kitchen tools above. I realized after I took this picture that I forgot a few – like I love the garlic press, the melon baller, the parmesan cheese grater, the fondue pot, the banana cutter, etc…but this gives you a general idea. 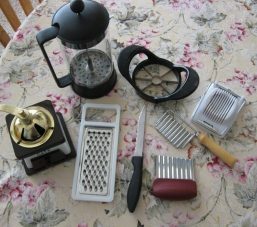 In the picture I have included: A small coffee grinder and a coffee/tea press, an egg slicer, an apple slicer, a knife for ages 7 and up and safer knives for younger kids. I am really enjoying my kids being in the kitchen with me! It actually helps me out and it is one thing I don’t have to cajole them into doing. And it helps with some of that “who is going to help mama tension” I finally figured…OK, I guess I can pick Sunii’s laundry off the floor every once in a while if the boy makes me fresh juice and coffee (LOL). *This is part of our “favorite blog posts” transfer. We are re-publishing these at the request of members after we closed our old blog 6 years ago.